NBC Olympics, a division of the NBC Sports Group, selected Leyard to provide fine-pitch LED video wall solutions for its production of the Games of the XXXI Olympiad, which took place in Rio de Janeiro, Brazil, concluding August 21. 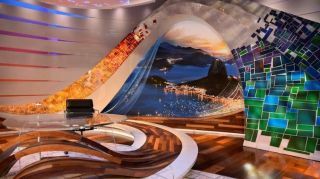 Leyard provided three TVH Series LED video walls for the NBC Olympics set within the International Broadcast Center in Rio, and one Leyard TVH Series LED video wall for NBC’s outdoor set in Brazil. The video walls include a 13-foot-wide by 13-foot-tall video wall comprised of 169 displays, as well as an 8-foot-wide by 7-foot-tall video wall made up of 56 displays, both with a 1.9mm pixel pitch for ultra-high resolution graphics and video playback. In addition, NBC’s sets featured a large, 9-foot-wide by 12-foot-tall 2.5mm pixel pitch in-floor display made up of 108 displays. “These video walls will be a stunning backdrop to NBC’s broadcast coverage, helping to bring all the excitement of the largest sporting event in the world to life,” said Jennifer Davis, chief marketing officer of Leyard International. “We are thrilled to have their technology featured in our studios for what will be an incredible Olympic Games in Rio de Janeiro,” said Atila Ozkaplan, senior director, technical logistics for NBC Olympics. The Leyard TVH Series allows for image adjustment to achieve broadcast-specific color temperatures and gamma levels more precisely. The Leyard TVH Series is designed to produce deeper blacks, higher contrast, and less reflection for on-camera installations.